Hair Ice: See Some of Nature’s Wildest Cold Creations! Hair ice has baffled scientists for a century. Let‘s break the heat, seeing one of nature’s more beautiful and mysterious creations. To beat the summer heat, here are some of Mother Nature’s most bizarre ice formations: Hair Ice. Full of swirls and curls, the frozen oddity’s precise formation baffled scientist for nearly a century… until now. 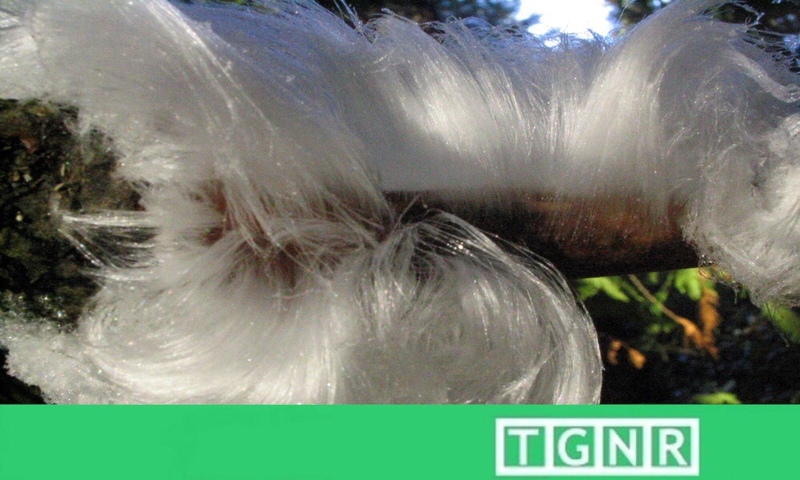 Found from Sweden to India, hair ice – or ice wool – sports gossamer threads of frozen water organized in to macroscopically ordered tufts. The frigid fur grows from areas of loosened bark. Therefore it necessitates humid and calm conditions at a temperature slightly below freezing. However with all the specificity hair ice requires to grow, scientists were looking for a unifying, underlying incipient factor. In 1918 German scientist Alfred Wegener was the first to study the hair ice phenomenon de rigueur. During his observations he noted a cobweb-like coat surrounding the hair-iced wood. Furthermore, a fellow researcher identified the webbing as fungus mycelium from which mushrooms ultimately grow. Consequently, Wegener speculated a relation between the concurrence of fungus mycelium and hair ice but the hypothesis lay dormant. Additionally, after nearly a century, Swiss scientist Gerhart Wagner made headway on Wegener’s theory when he doused logs who grew hair ice with either fungicide or hot water. Furthermore, both eliminated their ability to grow the ice formation. Therefore building on this data, Dr. Diana Hofmann and Dr Gisela Preuss closely analyzed and identified the fungus common to all their samples growing hair ice: Exidiopsis effusa. Ultimately the physics explains the rest. Dr. Christian Mätzler of the University of Bern, Switzerland, determined that a “wood–water–ice sandwich” forms on tree surfaces and pushes water through the tiny pores in the wood, thus forming the spiny ice spindles. A similar process causes Ice Flowers to grow overnight. In this case, the water is forced through pore in the stem of a living plant. Therefore the ice forms delicate layered folds that giving it the appearance of petals. Sources: Sci-News or read the original paper abstract. Additional information was found on these ice wonders at My World of Ice by Dr. James. R. Carter.